Miguel de Cervantes. Cervantes, Saavedra Miguel de, engraving. Miguel de Cervantes had an enormous impact on the development of modern fiction. His novel Don Quixote represents the first extended prose narrative in European literature in which characters and events are depicted in accord with modern realistic tradition. It is considered the original European novel, one from which all others, in some sense, are descended. Family and Early Life. Miguel de Cervantes was born on or about September 29, 1547, in Alcala de Henares, near Madrid, Spain, to Rodrigo de Cervantes Saavedra and Leonor de Cortinas. His father was a pharmacist and surgeon, and the family traveled frequently as he looked for work. Cervantes went to school in Madrid, where he probably wrote his first known works, poems on the death of Spanish queen Isabel de Valois, which were published in 1569. Soldier and Prisoner. 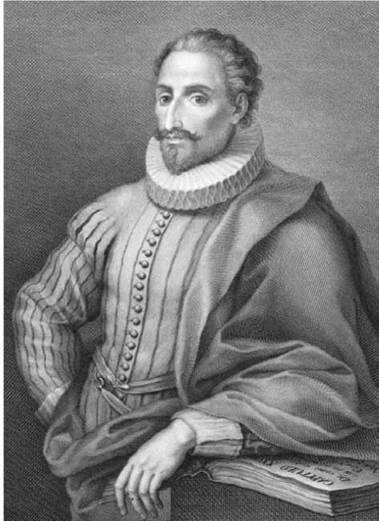 At that point, Cervantes had moved to Rome to serve as steward to Guilio Cardinal Acquaviva, a high-ranking clergyman. The following year, he enlisted with the Spanish army. In 1571, Cervantes fought in a naval battle off the coast of Greece. Although shot twice in the chest and once in his left hand—an injury that left him permanently crippled— Cervantes gloried in the victory for the rest of his life. His military career ended in 1574 and was followed by royal commendations. While returning from the Tunisian coast to Spain the following year, Cervantes and a group of fellow Spaniards were captured by Algerian pirates; for the next five years they remained imprisoned in North Africa. After four failed escape attempts organized by Cervantes and numerous setbacks to efforts on their behalf at home, the prisoners were finally ransomed, and the group returned to Spain as national heroes late in 1580. Early Writing. With a faltering Spanish economy, jobs were few and far between. The Spanish government spent vast sums on foreign wars and the flow of money from New World territories was being interrupted by enterprising British privateers who seized Spanish treasure ships in the name of Queen Elizabeth I of England. In hopes of fame as well as fortune, Cervantes began writing plays for the Spanish stage in the classical Greek tradition of Euripides and Aeschylus, though he focused on contemporary national concerns. It is believed that during the course of only a few years Cervantes wrote some thirty full-length plays, although only one was produced. In 1585, he wrote his first pastoral romance, Galatea and married Catalina de Salazar y Palacios. The following year, he took a position as requisitioning supplies for the Spanish Armada, a fleet of ships assembled for a planned invasion of England. The Spanish Armada was dealt a crushing defeat by the British navy in the English Channel in 1588. Historians speculate that this costly defeat marked the end of Spain’s power and influence in Europe. During the 1580s and 1590s, Cervantes found himself on the wrong side of the law for various reasons (debt, tax fraud, even suspected murder), and was imprisoned and released several times. Don Quixote. Throughout this period, he had continued to write both well-received poetry and unsuccessful plays. He began to write El ingenioso hidalgo don Quijote de la Mancha (Don Quixote) in order to capitalize on the public’s overwhelming interest in chivalric romances by writing a lively, salable parody of the genre. Part 1 was published in 1605 to popular and critical praise and was an immediate best seller. Part 2 (1615) was equally popular. The chivalric romances Cervantes poked fun at were tales of knights and ladies told by traveling storytellers of the earlier Middle Ages. By Cervantes’s day, the idea of a gallant knight setting off on a quest was considered an entertaining notion of a bygone era. Cervantes published a few more tales after Don Quixote, and was finishing a new novel when he died in 1616. Tycho Brahe (1546-1601): Danish nobleman, astrologer, and alchemist whose observations of planetary and stellar positions enabled the discovery of the laws of planetary motion. William Byrd (c. 1543-1623): English Renaissance composer well known for his liturgical music and works for harpsichord. Caravaggio (1571-1610): Italian Baroque artist whose use of naturalism was radical for his time. Philip II of Spain (1527-1598): King of Spain, Naples, Portugal, and Chile, as well as husband of Queen Mary I of England. He led the Spanish Empire to become a global power through expansion and exploration. William Shakespeare (1564-1616): An English poet and dramatist considered by many to be the greatest English-language writer, he died on the same date as Cervantes. The First Modern Novel. Don Quixote is widely considered the first modern novel. The term ‘‘novel’ in this case means a long work of fiction written in prose featuring realistic characters and settings. Don Quixote was, in fact, a self-conscious break from the popular prose genre of the time, the ‘‘romance,’’ which featured heroic characters and mythic settings. Cervantes used his work to poke fun at the popularity of these romances. Don Quixote has had a vast influence on the development of the modern novel. It remains a watershed work of art that exerted undeniable impact on the fiction of Henry Fielding, French writer Alain Rene Le Sage, Scottish writer Tobias Smollett, and other early novelists. The novel also anticipated—through its treatment of the comic outsider, satire of social convention, and exploration of the human psyche—countless later fictional masterpieces. Illusion and Reality. Although the structural components in this long novel are numerous, perhaps most important is its novel-within-a-novel scheme. Cervantes’s representation and examination of the fine line between real and imagined worlds, between sanity and insanity, between the world of the creative artist and the actual world, becomes the book’s central theme. The general trend in criticism has been overwhelmingly favorable toward Don Quixote. From the seventeenth century onward, the work has progressively been regarded as more than a comic entertainment. Ultimately, critics have viewed the novel as an epic masterpiece in which the abnormal psyche of the human mind, the friendship between individuals, and the struggle to create lasting art out of ordinary existence are dramatized in modern language and form. As ardent as the proponents of the work are, however, it has had prominent detractors. English Romantic poet Lord Byron, for example, claimed that Cervantes was responsible for extinguishing the chivalric spirit in Europe through his parodies of chivalric encounters, a charge repeated by English novelist Ford Madox Ford in 1938. Critics often claim that, had Cervantes not written Don Quixote, he would undoubtedly be an obscure writer in world literature today. What largely elevates the novel to greatness, according to many scholars, is the close and complex bond that develops between the two characters, Don Quixote and Sancho Panza. Don Quixote is commonly understood as a composite of the tragic idealist, the unbridled imaginative genius; Sancho, on the other hand, is the ardent skeptic, the simple-minded advocate of rationality. The Adventures of Tom Sawyer (1876), a novel by Mark Twain. An enterprising Southern boy rises to wealth and high society through a series of unlikely adventures. A Confederacy of Dunces (1980), a novel by John Kennedy Toole. Awarded the Pulitzer Prize for fiction, this novel follows Ignatius Reilly, a thirty-year-old man who still lives with his mother, as he seeks a job in 1960s New Orleans. The History of Tom Jones, a Foundling (1749), a novel by Henry Fielding. This comic classic chronicles the adventures and misadventures of a well-intentioned but unwise orphan, Tom Jones, after he is banished from his guardian's estate. The Idiot (1868), a novel by Fyodor Dostoyevsky. Prince Myshkin embodies innocence, but when he is caught up with a rich merchant's son obsessed with a woman, tragedy ensues. Madame Bovary (1857), a novel by Gustave Flaubert. Emma Bovary's romantic imagination and longing for an aristocratic life lead to adultery and her downfall. 1. Think about Don Quixote as the idealistic genius and Sancho Panza as the rational skeptic. Write an informal essay in which you describe the character you are more like. Do you have a close friend who is the opposite type? 2. Don Quixote was adapted for stage as the musical Man of La Mancha, and its 1965 Broadway production garnered numerous awards. The musical was adapted for film in 1972. Read the novel, then watch the film version. Bearing in mind that Cervantes wrote Don Quixote to satirize popular chivalric romances, what do you make of the characterization of Don Quixote in the film? What aspects of Don Quixote does the film highlight? Why do you think this version of Don Quixote would appeal to modern viewers? 3. Harper Lee wrote To Kill a Mockingbird, considered a classic of American literature, but she has published nothing since. Cervantes’s reputation arguably rests on one novel as well. Do you think someone should be considered a ‘‘classic’’ writer for just one work, or should a reputation be based on multiple works of high quality? Write an essay arguing your point of view, being sure to use specific reasons. Canavaggio, Jean. Cervantes. Trans. J. R. Jones. New York: Norton, 1990. Church, Margaret. Don Quixote: Knight of La Mancha. New York: New York University Press, 1971. Frye, Northrup. ‘‘The Acceptance of Innocence.’’ In Northrop Frye on Culture and Literature: A Collection of Review Essays. Chicago: University of Chicago Press, 1978. Goldberg, Jake. Miguel de Cervantes. New York: Chelsea House, 1993. Madariaga, Salvador de. “Don Quixote’’: An Introductory Study in Psychology. Oxford: Oxford University Press, 1966. Mondador, Arnoldo, ed. Cervantes: His Life, His Times, His Works. Trans. Salvator Attanasio. New York: American Heritage, 1970. Predmore, Richard. The World of “Don Quixote.’’ Cambridge, Mass. : Harvard University Press, 1967. Russell, P. E. Cervantes. Oxford: Oxford University Press, 1985. Bamforth, Iain. ‘‘A Lance for Hire: 400 Years of Don Quixote.” Quadrant 50 (November 2006): 68-71. Qualia, Charles B. ‘‘Cervantes, Soldier and Humanist.” South Central Bulletin 9 (January 1949): 1, 10-11. Cervantes Project. Retrieved May 24, 2008 from http://cervantes.tamu.edu/V2/CPI/index.html. Cervantes Society of America. Retrieved May 24, 2008 from http://www.h-net.org/~cervantes/csapage.htm.